About a month and a half ago, I did a Sunday Night Flicks about watching Harry Potter and the Sorcerer’s Stone. It was fun to watch with the kids for the first time and to see how much they got into it. My oldest in particular really enjoyed it a lot. He enjoyed it so much, that over the next little while we were watching nothing but Harry Potter. He wanted to finish all of the films, and he wanted to do it as quickly as possible. The other kids enjoyed the first one, but they were not so quick to want to watch the rest. They had lost interest by the end of Sorcerer’s Stone, and when we suggested that we watch the next one the next day, they politely (insert sarcasm here) said, “No thank you.” Johnny didn’t mind. That meant he had the family room all to himself. Well, not really. He had the family room all to himself, plus me. Johnny doesn’t like to do anything alone, so there was no way he was going to watch these movies downstairs, all by himself. For my part, it meant I could sit down and watch 7 more 2 hour movies, and not feel guilty because I was bonding with my son. So, here’s the kicker: About two films into our Harry Potter adventure, it really wasn’t about sitting down to watch a film for a couple of hours. It really became about bonding with my son. Watching the films with him, I saw the excitement and magic I experienced when I first read the books. Johnny can’t just sit and watch something. He has to talk about what he is watching and he has to ask questions. He especially likes to ask questions about what is happening and what is going to happen. He can’t stand not knowing what is going to happen. About halfway through the 4th movie, he started asking me who was going to win, Harry or Voldemort. I chuckled each time and told him he would have to wait. He hated that answer. He wanted to know right now. I think he was genuinely concerned that Harry may not win, and I don’t think he wanted to watch it to the end if that was the case. There is so much there that was just like me when I was a kid. Heck, it’s just like me now. I can’t stand not knowing what is going to happen. Sometimes, when I get a new book, it takes every bit of my will power to not look at the ending. I totally understand this is not the suggested course of action. I enjoy the book or movie much more if I don’t know what’s going to happen, but sometimes, it is just so hard to wait. I think a big reason why is because I am a happy ending kind of guy. I don’t like it when the hero loses or they die or whatever. I like good to conquer evil. That’s my preference. I don’t want to care about these characters just to have them lose or die in the end. I remember how I felt when I read The Lord of the Rings for the first time, and you get to the part where Frodo gets stung by Shilob, and Tolkien let’s you think he is dead. I almost threw the book down and stopped reading then and there. What was the point if the main character was going to die? Of course, he didn’t die. He lived, all the hobbits lived, and I was happy. I felt the same way when I read Harry Potter and the Deathly Hallows and Harry died. I mean, he was really dead for a minute. He got better, though, and we got our happy ending after all. Watching Johnny stress about what was going to happen brought back all those memories, and it was pretty cool. The other thing that was a lot of fun was watching Johnny just obsess about something. He is officially a Potterhead. He knows all the characters and the story and everything. After he was done watching the films, he begged us to take him out on Pottermore. I don’t know how he learned about it, probably from some YouTube video, but he wanted to go so bad. So we went out there, and he couldn’t wait to be sorted. Unfortunately, in his mind, he was sorted into Hufflepuff. He decided that only happened because he used his proper name, John, instead of his real name (in his mind), Johnny. He tried it again, this time trying to guess which answers would put him in Gryffindor. 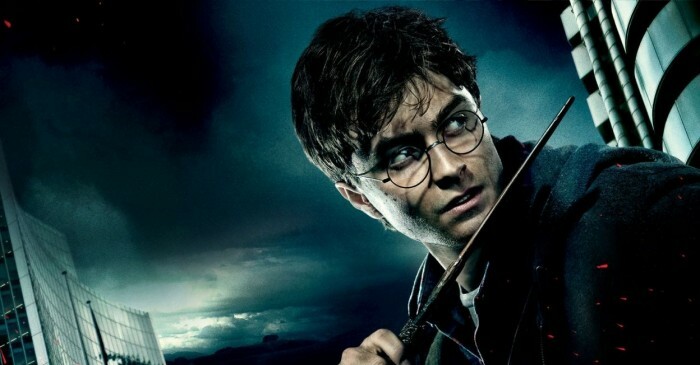 He was reasoning was pretty sound, like when the question was “What are you afraid of?,” he selected being alone, “because,” he said,”Harry, Ron, and Hermione were always together, so they must be afraid to be alone.” All this figuring on his part did lead him to a different result than the time before. It still wasn’t Gryffindor. Instead, he ended up in Ravenclaw, which makes sense, since he got there by trying to outsmart the test. At the end of the day, I went into this experience as a big Harry Potter fan. I came out of it with a better appreciation for my son, and he for me. We got closer to each other than we were before. For me, I always enjoyed Harry Potter. I always liked the story, but I also felt like I was just a little too old to be obsessed with, and too much of a not teenage girl. The reality is, now, Harry potter will always be a little more meaningful for me because I got closer to my son. It will always be the first fandom we really shared with each other. Now, he we are, just waiting for our new Harry Potter Funko Pop characters to come from Amazon, and to see what Harry Potter related guests will be announced for the upcoming Salt Lake Comic Con, wands at the ready. This entry was posted in Harry Potter, Sunday Night Flicks and tagged Harry Potter on July 22, 2015 by Jake Dietz.